Last analysis of US Oil expected that upwards movement was over for now and that downwards movement should resume. Price has moved slightly higher before turning lower. Price remains below the invalidation point. Minor wave 3 has now most likely begun and is most likely extending. When third waves extend they usually clearly show their subdivisions on the daily chart. So far this wave count has a typical look. I have drawn an acceleration channel about minor waves 1 and 2. Minute wave ii has moved slightly higher but has not properly breached the channel. Upwards corrections should continue to find resistance about this trend line. Minor wave 3 should breach the lower edge of this channel. I would still want to see movement below the small parallel channel about the upwards wave of minute wave ii before I have confidence that this correction is over and the next wave down is underway. I want to see a clear channel breach with at least one daily candlestick below the green channel, and not touching the lower trend line. If minute wave ii is over here then at 83.17 minute wave iii would reach 1.618 the length of minute wave i. The targets for minor wave 3 remain the same. 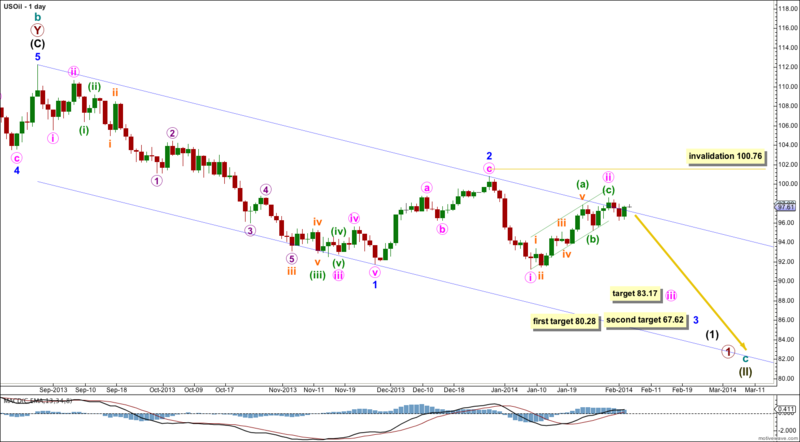 At 80.28 minor wave 3 would reach 1.618 the length of minor wave 1. If price continues through this first target, or if when it is reached the structure is incomplete, then the second target is at 67.62 where minor wave 3 would reach 2.618 the length of minor wave 1. Minute wave ii may move beyond the start of minute wave i. This wave count is invalidated with movement above 100.76.